Lesson 19 – Will the souffle rise? The usual pre-class nervousness is heightened. 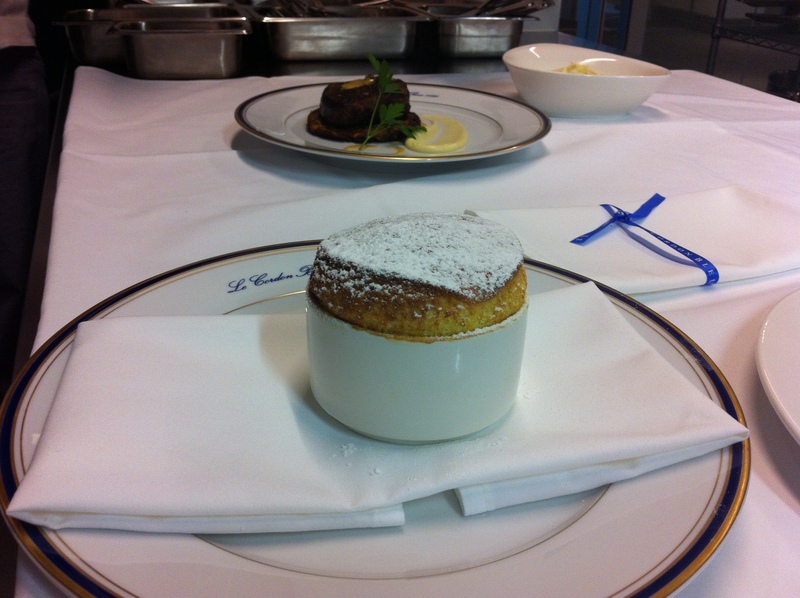 It’s the dreaded soufflé and Chef has done a great job winding us all up. 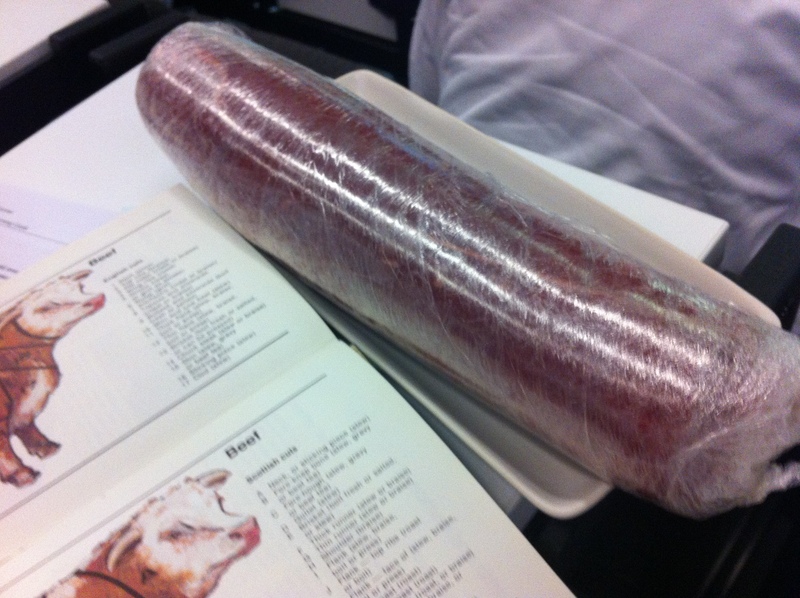 We’re also cooking 90 day-aged Angus beef with a peppercorn sauce and making a kumara galette for it to sit on. Yes, lots of last minute cooking again with timing ability really being put to the test. Sometimes when you cook fillet steak it loses its shape in the pan. Here’s the answer. When it has been trimmed, roll it in glad wrap, reasonably tightly but too tightly, and let it rest in the fridge. It helps keep it a nice round shape. Chef often throws in a little extra for us – not an extra to be tested on but just something nice that will add to the dish and for lesson 19 it’s a cauliflower puree. With all the prep done for the steak and the puree ready, it’s time to put the soufflés in. I’m relieved once it’s in the oven because there’s nothing else you can do, except burn it or undercook it. It’s all in the creaming of the base and whipping of the eggs which I hope I got right. I check and it’s coming up but it seems so slow. I’m making the galette now and the steak has been thoroughly seared and is in the oven. I resist the temptation to turn up the oven heat. I’m ready to serve but the soufflé isn’t cooked after the required time. It has been in 20 minutes so I start plating up. I’m pleased with the colour of my galette. The puree is smooth and creamy – well it would be. It’s cooked in cream, blended in cream with butter added. Ah yes, the blender. Chef reminded class this morning to make sure they are careful with the blender All eyes are on me and a few laughs. I’m going up with my offerings. Icing sugar is ready to sprinkle on the soufflé. Once it’s out that’s it. I’m off! Chef’s down the other end of the room so I hollow inelegantly. He gets to the serving bench before the soufflé drops. All is good with the world. Beautiful! What a delicious combination for a meal too. Thanks for another mouth-watering episode Heather. 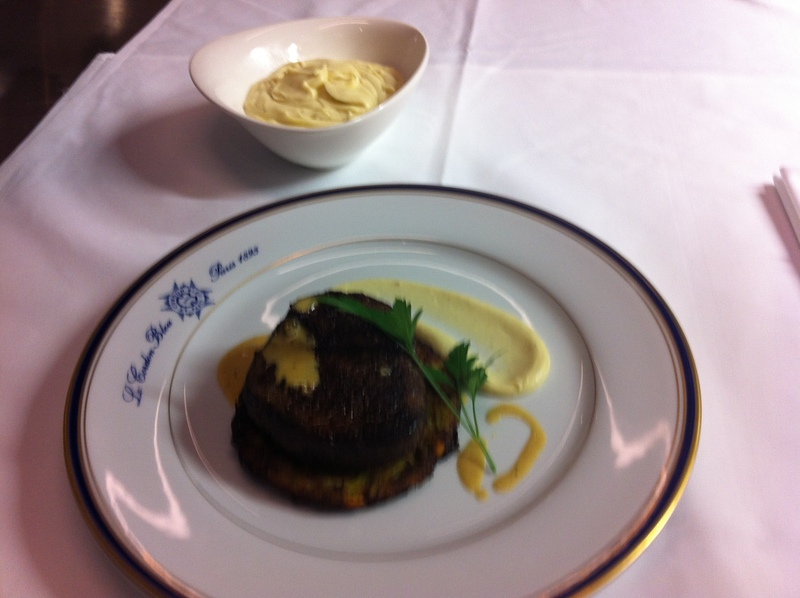 Another amazing meal – I don’t think I’ve ever eaten (or cooked!) soufflé. Thanks for your very interesting bloggs. Can’t wait to read the next. I’m trying your sear and in the oven technique with fish and it works a treat. It all looks lovely especially the soufflé!! Clever you ! Don’t think I have ever made one either. Yay for your souffle. Well done you. Like the tips for holding the shape of beef too.